At a meeting of the Faculty of Arts and Sciences on May 7, 2002, the following Minute was placed upon the records. Willard van Orman Quine: His writings are carefully crafted, and overall he has few equals as a prose stylist among philosophers of our time. 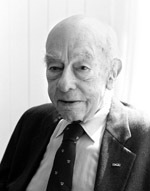 Willard van Orman Quine, one of the most eminent philosophers of the twentieth century, was born June 25, 1908 in Akron, Ohio. He grew up in Akron and attended Oberlin College, where he received the A.B. in mathematics in 1930, already interested in logic and philosophy. He came to Harvard as a graduate student in 1930 and was affiliated with the University for the rest of his long life. He completed the Ph.D. in two years under A. N. Whitehead, co-author with Bertrand Russell of Principia Mathematica. He spent 1932-33 in Europe as a Sheldon Fellow and encountered the Vienna Circle, Carnap in Prague, and Tarski in Warsaw. These encounters were decisive for his future work. In 1933 he was elected to the first group of Junior Fellows of the Harvard Society of Fellows. He was Faculty Instructor in Philosophy from 1936 to 1941, associate professor from 1941 to 1948, professor from 1948 to 1956, and Edgar Pierce Professor of Philosophy from 1956 until his retirement in 1978. During World War II he worked in a Navy unit that decoded, translated, and analyzed coded messages from the German submarine fleet. His earlier research and writing were mainly in logic. His efforts to simplify Russell's theory of types led to his probably most important contribution to mathematical logic, the set theory NF of his paper "New foundations for mathematical logic" (1937). Research on this theory has continued up to the present day. For Quine the end point of this line of work was the book Mathematical Logic (1940), although he continued to make other contributions to mathematical logic. But for Quine logic and philosophy were closely integrated. Out of his teaching of the introductory logic course Philosophy 140 came his classic textbook Methods of Logic (1950, 4th ed. 1982). Quine's elegant and economical exposition goes hand in hand with expressing important views on the philosophy of logic, such as avoiding dependence on the traditional notions of proposition and property. According to Quine's testimony in several writings, the logical positivism of the Vienna Circle, especially the work of Carnap, had a greater impact on him than the philosophy of his Harvard teachers. The Circle's scientific world view, empiricism, and stress on modern logic became permanent parts of his philosophical outlook. But already in his earliest philosophical writings he criticized specific positivist views, for example that logic is true by convention and that ontological questions about what there is can be dismissed as metaphysical. However, his major impact on the philosophical world begins with his criticism of the distinction between analytic and synthetic truths in the famous "Two dogmas of empiricism" (1951). This time, his target was not just logical positivism or views about logic but views that were very widely held, and not only among those who styled themselves empiricists. The collection From a Logical Point of View (1953) summarized Quine's early philosophical work. In the 1950s Quine worked toward a more systematic view incorporating his criticisms and the holistic picture of meaning and the relation of knowledge to experience sketched in the last section of "Two dogmas." Such a view was presented in the major work Word and Object (1960), which deals with meaning, knowledge of meaning, and reference from a naturalistic point of view. The book is famous for the thesis of the indeterminacy of translation: unquestionably different systematic translations of an alien language into one's own can be equivalent as regards any possible evidence for them, even as regards any possible more fundamental facts. But Word and Object is a treatise on the philosophy of language, epistemology, metaphysics, and the philosophy of science, with a profound guiding point of view as well as many influential particular analyses. The title essay of Ontological Relativity and Other Essays (1969) formulated the idea of the "inscrutability of reference," already implicit in the indeterminacy of translation. Another essay made explicit a program for a naturalistic epistemology, one of his most influential ideas. Quine continued to develop and modify his philosophical views in The Roots of Reference (1974), which carried out one part of the program of naturalistic epistemology, and the collection Theories and Things (1981). His views about truth and the relation of meaning to stimulation of our sensory receptors underwent significant changes in the late works Pursuit of Truth (1990) and From Stimulus to Science (1995). He continued active work in philosophy until the age of 90. Quine came to exercise enormous influence, although few were persuaded by his philosophy as a whole. His views were controversial from the start and attracted many critics. Quine responded deftly and with maximum economy; he could be devastating but his style was never polemical. His writings are carefully crafted, and overall he has few equals as a prose stylist among philosophers of our time. Even where technical logic intervenes his sense of style is in evidence. As a teacher Quine was carefully organized, precise, and conscientious, but somewhat dry in his classroom style. Writing and teaching went together, especially in logic. He maintained high standards and was in academic matters a conservative. Among his students were some of the most distinguished post-war figures in logic and philosophy. Quine disliked administration and largely avoided it. He was only briefly Chairman of his department. He was President of the Eastern Division of the American Philosophical Association in 1957 and President of the Association for Symbolic Logic from 1953 through 1955. In contrast, a responsibility he found thoroughly congenial was that of Senior Fellow of the Harvard Society of Fellows, which he held from 1948 to 1978. He received many honors, including seventeen honorary degrees, the Rolf Schock Prize in Logic and Philosophy in 1993, and the Kyoto Prize in 1996. Quine was well known for his sociable personality, his wide-ranging curiosity, his love of travel, and his interests in languages and geography. As a traveler he was adventurous but also sought to cross as many borders as possible. His travels figure prominently in his autobiography The Time of my Life (1985). In 1930 he married Naomi Clayton; the marriage ended in divorce. In 1948 he married Marjorie Boynton, who died in 1998. Quine died December 25, 2000. He is survived by four children, Elizabeth Roberts, Norma Quine, Douglas Quine, and Margaret McGovern, six grandchildren, and a great-grandchild.